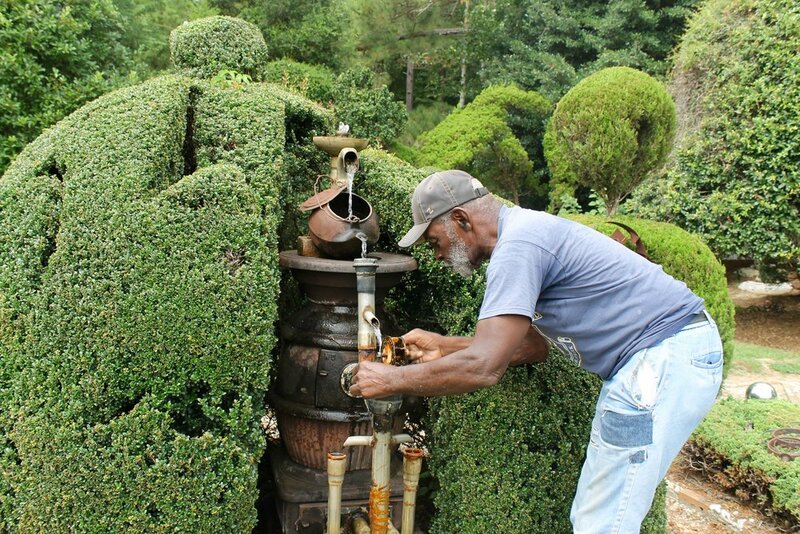 Over a year ago we were introduced to Pearl Fryar and Bishopville, SC in the pages of “Places for the Spirit: Traditional African American Gardens”, a photobook documenting Southern Black gardens through the lens of Vaughn Sills. In August, we drove from Hilton Head, SC to Orangeburg, SC and stayed for two nights at Thee Matriarch Bed & Breakfast, a charming Black-owned B & B. Rachelle and Chef Fred are extremely accommodating and hospitable. Support Black business! 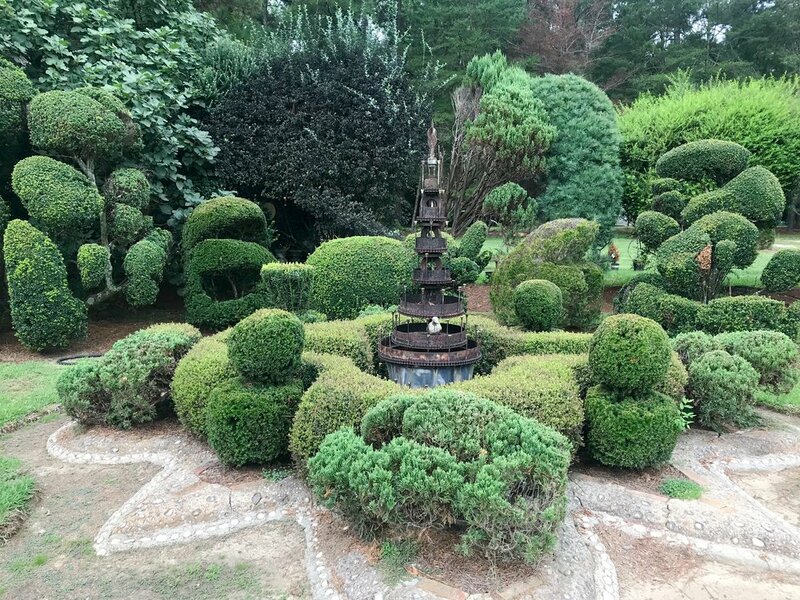 On our last day we drove over an hour to experience Pearl Fryar’s Topiary Garden. Strikingly different from the other gardens featured, Pearl’s stood out as a brilliant example of the depths of Black creativity and ingenuity. Using discarded plants, Pearl creates what he calls “abstract, free form” topiary masterpieces. 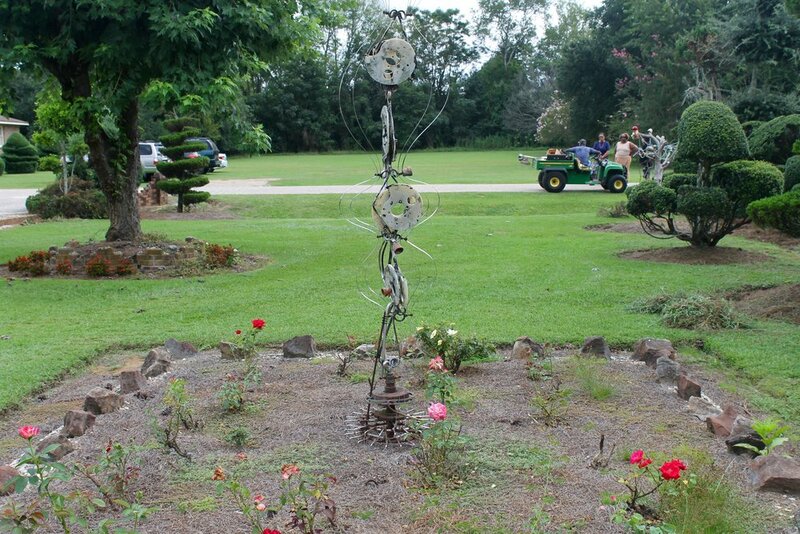 Among the botanical sculptures are repurposed and salvaged pieces Pearl turned into fountains and garden decor. The theme of peace, love and unity can be seen in his work as well as in Pearl himself. A space for everyone, the garden is free and open to the public although donations are always welcome. No longer able to easily walk across his 3-acre property Pearl rides a tractor to care for the garden and greet visitors. The universe sincerely blessed us with a heartfelt conversation with Pearl. As soon as we pulled up he rode over to welcome us. Needless to say we were awe-struck. An enchanted land, a piece of heaven in the middle of the South. Tranquil. Peaceful. Abundant. You can see and feel every part of Pearl in the garden. All of the love and long hours after work, the passion. It makes you stop, look up and wonder about your own passions. About what drives you. What really inspired us is the freedom Pearl has to get lost in his own creativity. In researching Pearl we learned when he bought his home the community originally didn’t want him there. Based on their racist beliefs they thought Pearl, a Black man wouldn’t keep his property up. Fast forward to today and visitors can see his neighbors creating their own versions of topiary gardens. As noted in the documentary, “A Man Named Pearl” the cul-de-sac is now full of Black home-owners. Which brings up a poignant issue - the value of Black creativity. It took seven or so years before Pearl started receiving national and global recognition. Visitors come to Bishopville from neighboring cities, states and countries as far as China just to see Pearl’s work. It wasn’t until he appeared in publications with predominantly white audiences did his rise to fame begin. As seen in “A Man Named Pearl” he is the gem of Bishopville. Someone who can put Bishopville back on the map. The once bustling southern town is now thinking of ways to monetize the influx of visitors. As some may see it as white folks once again monetizing Black creativity and ingenuity, Pearl sees his work as a way to unite people from all different backgrounds and walks of life.